It seems that bakers everywhere are breathing a sigh of relief as some pressure has eased up from the gluten-free fad and turn to a much more filling trend in bread—the locally sourced, freshly milled, whole grain loaf. Luckily, Brooklyn has a lot of great bread options but recently we’ve been gifted with two more exciting projects within reach of Greenpoint. 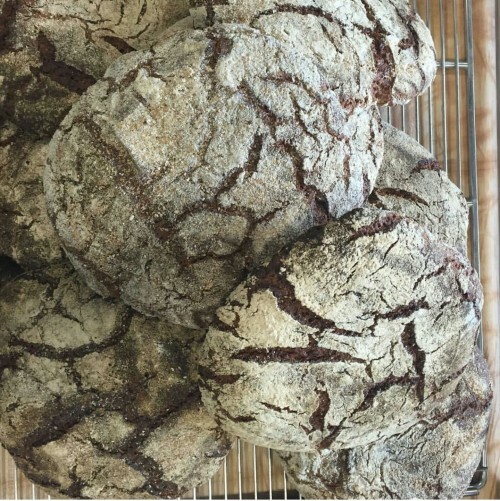 Although only available on the weekends, pop-ups from Meyers Bageri and Brooklyn Bread Lab are slinging rockin’ loaves of naturally leavened, whole grain breads that are worth waiting for. Now more than ever, people are touting the health benefits (yes, benefits!) of eating bread. A loaf made from fresh, local, grains is an entirely different thing than the bagged fluff you buy at supermarkets. If your bread label has more than three ingredients, something probably isn’t right. Besides the added benefits of including whole grains in your diet, eating fermented foods (for example, sourdough breads) is great for digestion. But you already know that from watching Michael Pollan’s “Cooked” mini-series on Netflix, right? Unless you’ve been living under a rock, you’ll recognize the name Claus Meyer. The treasured TV personality, cookbook author and founder of world renowned restaurant, Noma, in Copenhagen has made his way to New York. Meyer has a range of projects slated to open within the next few months, ranging from fine dining restaurant Agern and Nordic food hall in Grand Central station to a bakery in the heart of Williamsburg. Meyers Bageri is currently hosting a pop-up in Williamsburg’s Margo Patisserie every Saturday with plans to convert the space permanently later this spring. They are currently operating out of a commissary kitchen in Long Island City and will soon install a large mill to begin grinding their own flour. The baked goods on offer are usually the same each week, with some variety in flavors. The star of the bunch is the Rugbrød, a rustic whole grain rye loaf which is so dense it could be used as a weapon. 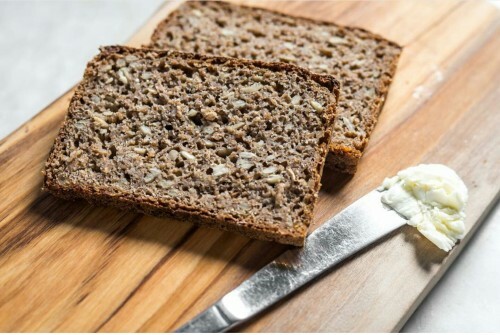 According to the official website of Denmark, Rugbrød is a nutritious alternative to whiter breads and boasts low fat and sugar, and high fiber content. It is perfect for making Danish specialty smørrebrød, an open faced sandwich that can be piled with any variety of toppings. It’s also worth visiting to try the morning bun which is a high hydration, super chewy and light roll that you can buy on its own or have smothered with any combination of jam, cheese and butter. It is a Danish specialty and one of the best breads I have tried in New York. Brooklyn Bread Lab, spearheaded by Chef Adam Leonti of soon-to-open Williamsburg hotel restaurant, is located a hop, skip and jump away from the beloved Roberta’s at 201 Moore Street. The lab is a sparsely furnished, large open space but it appears to be just a couple of guys, a couple of deck ovens and some freshly milled flour. A variety of grains are ground on their 10,000 pound stone mill and tables are stacked high with hefty bags of Einkorn, Wheat berries and others waiting to be put through the mill. The options available at the lab seem to be a bit more limited but that’s because it isn’t really a bakery. It’s more of a test lab (hence the name) that is nice enough to share with the public. And they are pumping out some great stuff. When I visited they had a mountain of beautiful crackly rye loaves and only one sourdough loaf left which I obviously pounced on. The breads both had great crust and texture but the taste was incredible. If you don’t believe that freshly ground flour makes a difference, please go here and try their bread immediately. Whole Grain Croissant. Photo via Brooklyn Bread Lab Instagram. At the moment the lab is only opened on Friday-Sunday and you should definitely check their Instagram before heading over to see what’s on offer and make sure they are opened. They do occasionally close for other events or sell out unexpectedly. 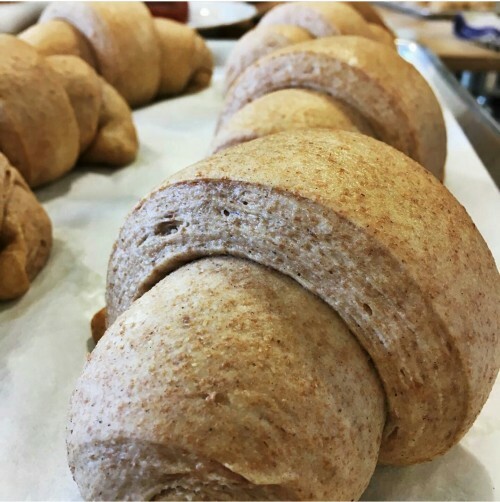 In addition to selling awesome bread, they offer classes for bread, pizza and pasta making as well as a class about whole grains for industry professionals. Hop on your bike and visit Brooklyn Bread Lab at 201 Moore Street or Meyers Bageri at Margo Patisserie at 667 Driggs Avenue. We promise we won’t tell the folks at Old Poland Bakery. Danielle is a former 9-5er turned professional baker. She loves traveling, hunting for used books and records around Brooklyn and eating cake for breakfast.